Memphis May Fire and We Came As Romans Launch The Bands Vs. Food Co-Headline Tour; Bands Will Take To The Road To Share Their Love of Food with Fans – Ouch That Hertz! 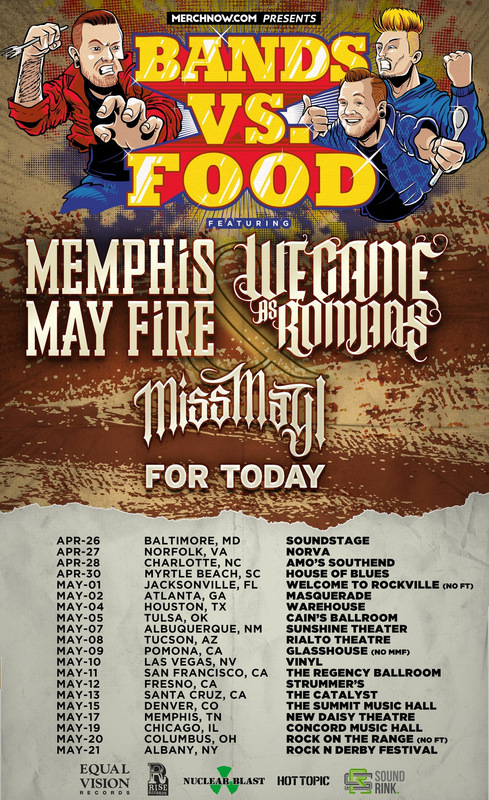 Memphis May Fire and We Came As Romans are teaming up for the co-headline Bands Vs. Food Tour which kicks off April 26 and runs through May 21. Joining the bands on the trek are Miss May I and For Today. VIP Ticket pre-sale launches on Thursday, March 10 at 12pm ET. General admission tickets will go on sale Friday, March 11 at 10am local time. Both Memphis May Fire and We Came As Romans share a passion for all things food & this Spring they’ll be visiting local restaurants in each market before hitting the stage. In connection with the tour’s theme, fans are encouraged to hit up WCAR & MMF via social media to recommend their favorite local dining spots near each venue & those who purchase a VIP Package will join the bands for a catered meal from the chosen restaurant in addition to receiving unique merchandise items / special perks. Additionally, the tour will feature specialized video updates from each city that include restaurant reviews, VIP party footage & live performance content. Expect to see all of the bands on the tour as well as the fans themselves involved in these updates. Memphis May Fire have been hard at work on the follow up to their massively successful 2014 Rise Records LP, ‘Unconditional,’ which debuted at #4 on Billboard’s Top 200 and #1 on the Alternative Albums chart. For the new album, the band has enlisted producer Matt Good (From First To Last, Blessthefall, The Word Alive) with Cameron Mizell (For All Those Sleeping, Myka Relocate, Sleeping With Sirens) handling vocal production duties. The forthcoming effort was recently selected as one of the ‘Most Anticipated Albums’ of 2016 by the editors of Alternative Press. Starting this month, the Nashville, TN-based rockers will serve as direct support on Killswitch Engage’s headline tour. Offering additional support is 36 Crazyfists & Toothgrinder. Tickets for those shows are on sale now. Band Vs. Food Tour ft.